Wednesday was my birthday, and it has been my custom for many years now to take the day off and go hiking/bugging somewhere. Coming as it does in early spring, it is usually the first real bug collecting trip of the year. This year, however, I was roped into a short business trip to visit a USDA lab in Brookings, South Dakota, so tradition would have to take a back seat. My visit at the lab ended early, though, and my flight back home from Sioux Falls didn’t leave until that evening, so I studied the map to look for any possible nearby points of interest in this landscape that has, for the most part, been unforgivingly converted to fields of corn, soybean, and wheat. 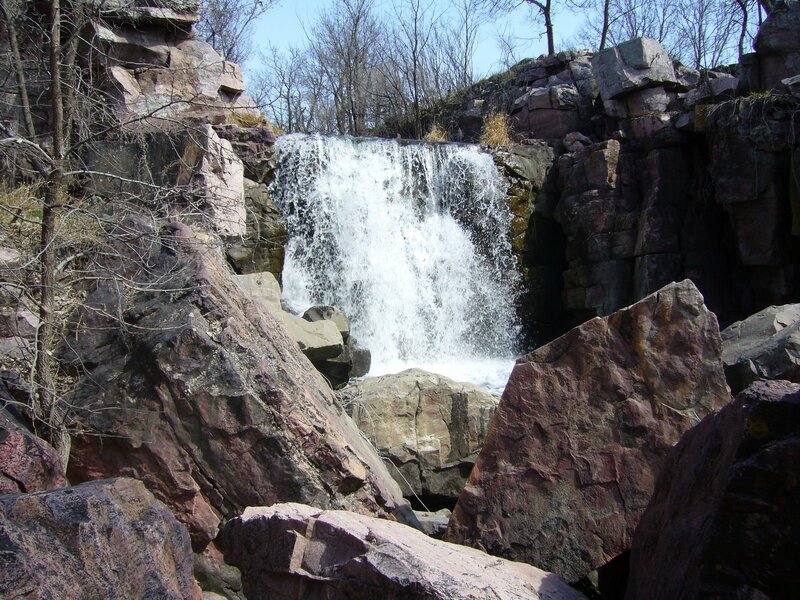 I quickly noted a place called Pipestone National Monument just over the border into Minnesota. I love stopping at national monuments while traveling – they usually have some significant historical or geological interest, and their typically (though not always) small size means one can fully explore the area in a relatively short time. I did not know or had never heard of this place, but what I found was a charming little jewel tucked within a remnant of tallgrass prairie. At this far northern latitude, spring is still in its earliest of states. Few insects would be seen, but nevertheless I felt thankful for the chance to spend time outdoors and in a place of beauty where I could reflect on the years gone by and those (hopefully) still to come. 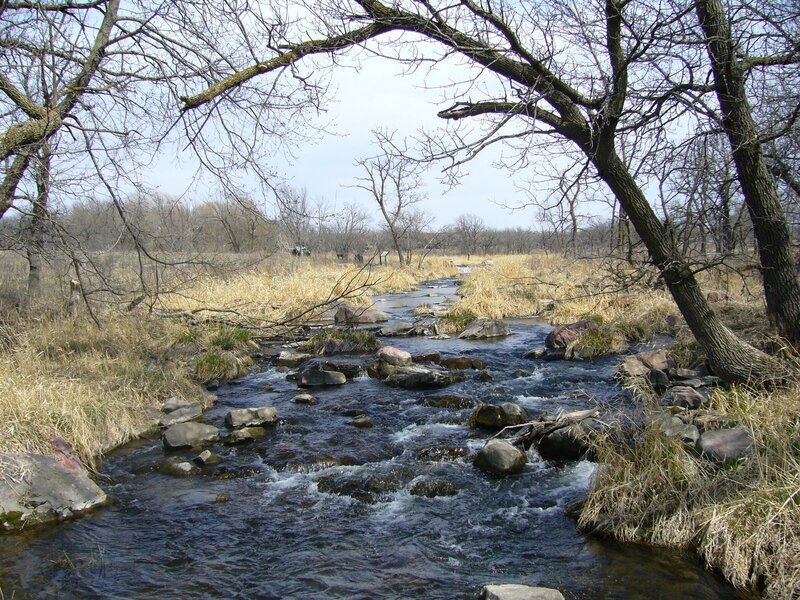 The area is named for a thin layer of catlinite – pipestone – exposed in this small area that has been quarried for centuries by Native Americans for carving into pipes (both war and peace). Quarrying within the monument continues to this day, with permission to do so reserved by law only to registered Native Americans. The area is identified as a sacred site associated with Native American spiritual beliefs and is preserved as a significant cultural and ethnographic landscape. Of particular interest to me was the site’s distinct hydrologic/geologic landscape and the native tallgrass prairie associated with it. A short ¾-mile trail loops through the area, providing a diverse glimpse of the area’s unique features. 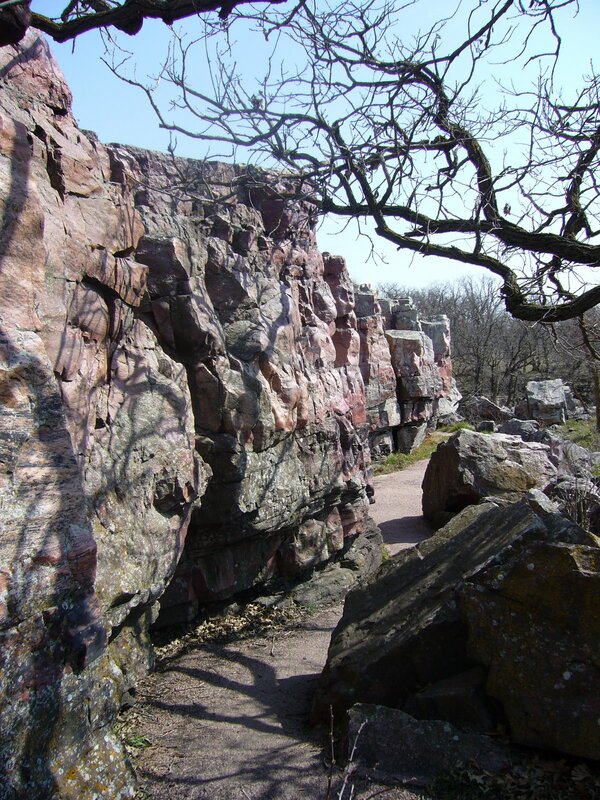 Pipestone may have provided the area’s namesake, but a narrow exposure of Sioux quartzite is the area’s most prominent geologic feature. Sioux quartzite is derived from billion and a half year-old layers of sand/silt sediments deposited thickly on the floors of ancient, Precambrian seas and compressed over the vastness of time into a hard, reddish metamorphic rock. Normally covered in this area by glacial till, the layers at this site are tilted upward 5–10 degrees towards the west and break through the surface to form a jagged, mile-long west-facing escarpment 23-30 feet high. Underneath the quartzite is the pipestone, a thin layer of metamorphosed shale. This fine-grained rock is derived from clay deposits, thus it is much softer and redder than the harder-than-steel quartzite. Pipestone Creek bisects the escarpment, giving rise to the lovely Winnewissa Falls, flowing over the escarpment and running down to a small, natural empoundment (Hiawatha Lake) before continuing its journey back into the glacial till and tallgrass prairie (for anybody surprised that there should be “falls” in this part of the country, it is interesting to note that nearby Sioux Falls is named after a grander example of of such flowing over quartzite exposures in its downtown). Precious little remains of the expansive tallgrass prairie that once extended from horizon to horizon in this area. A few small parcels managed to escape the plow, but even in those tiny remnants dramatic alterations in plant communities have occurred due to fire suppression and the introduction of more than 70 non-native plant species. Prescribed burning programs are now being used at the Monument to restore the prairie’s native plant composition and appearance. Looking out over the tallgrass prairie remnants above and below the quartzite escarpment, it I was tempted to visualize circles of teepees on the higher ground away from the quarries (all Native American tribes worshipped this site and would never camp directly within it), with herds of American bison dotting the landscape in the distance. 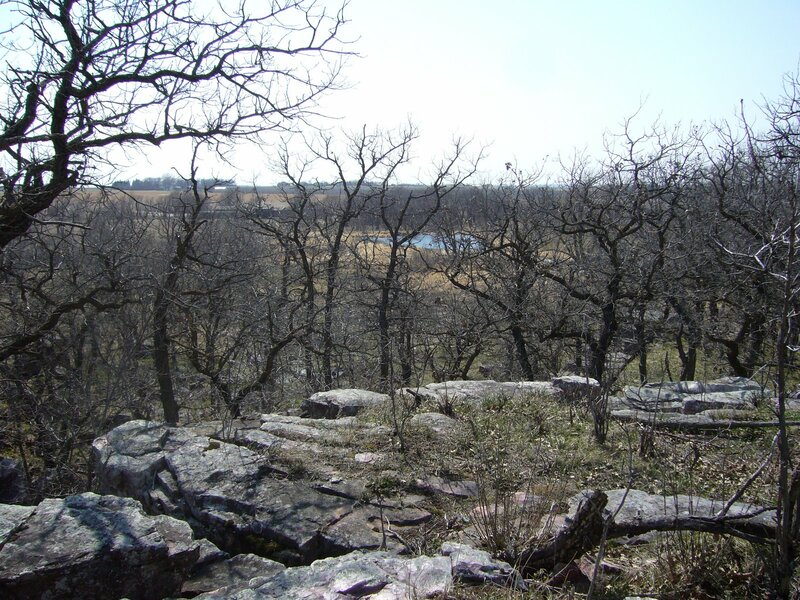 Contrasting with the openness of the prairie, the escarpment itself is densely studded with trees – American elm (Ulmus americana) along the top edge, and bur oak (Quercus macrocarpa) in the escarpment itself. Unlike the large, sometimes towering examples of their kind found further to the east, the trees here are dwarfed and spreading, almost gnarled. Below the escarpment, woodland quickly gives way to pure stands of smooth sumac (Rhus glabra) and choke cherry (Prunus sp. ), which just as quickly yield to the surrounding sea of prairie. Along Pipestone Creek below the escarpment, lower layers of exposed quartzite provide nooks and crannys where enough moisture collects to support the growth of green ash (Fraxinus pennsylvanica) trees, until glacial till once again covers the quartzite, and riparian woodland yields to grasses and forbes. 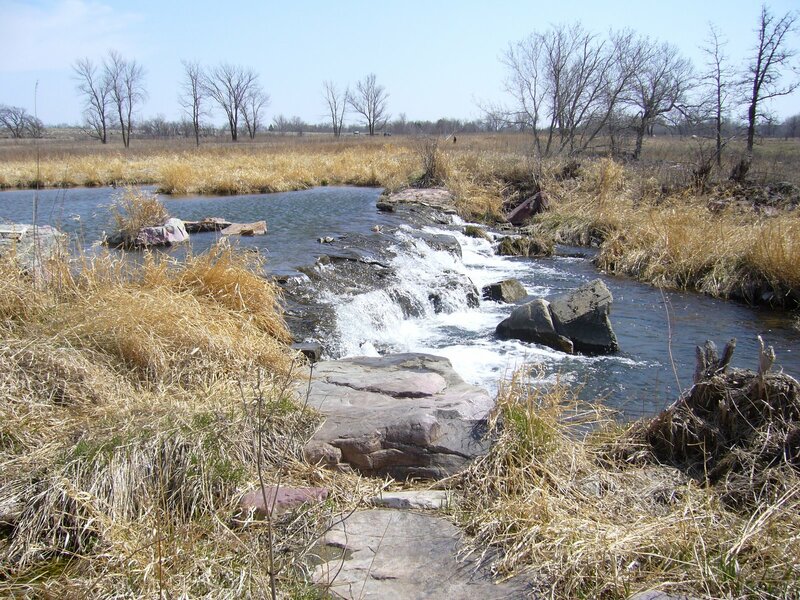 It’s not hard to imagine why this became a special place to the Native Americans, even before they discovered the pipestone that was to become so important to their culture. 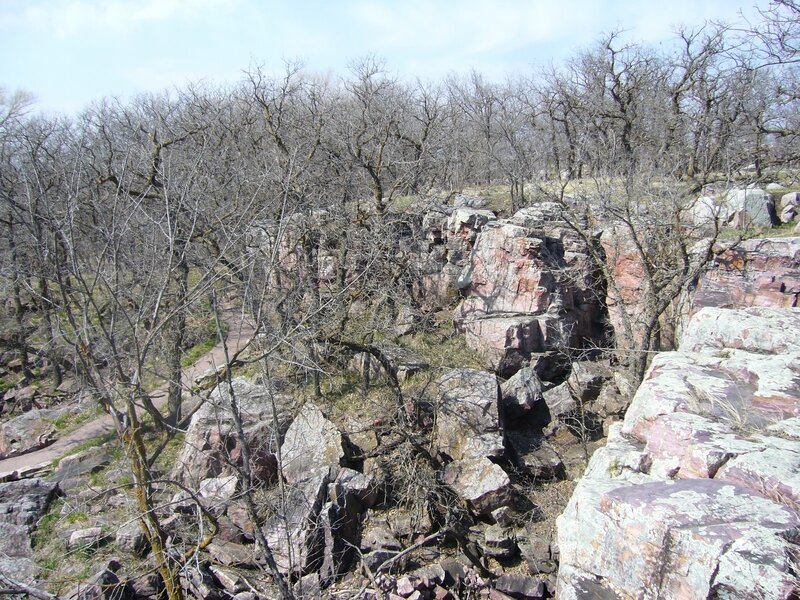 The pipestone quarries are located a short distance to the west of the escarpment – where the hard quartzite layer is thin enough to break through – and, thus, have had little impact on altering the physical appearance of the escarpment itself. Winnewissa Falls (meaning “Jealous Maiden” in the Dakota language), lies at the center of the escarpment, providing a stunning centerpiece. Despite its beauty, it is but a shadow of what it was before early settlers in the area blasted away the top 18 feet of the ledge to create a reservoir for drinking water. 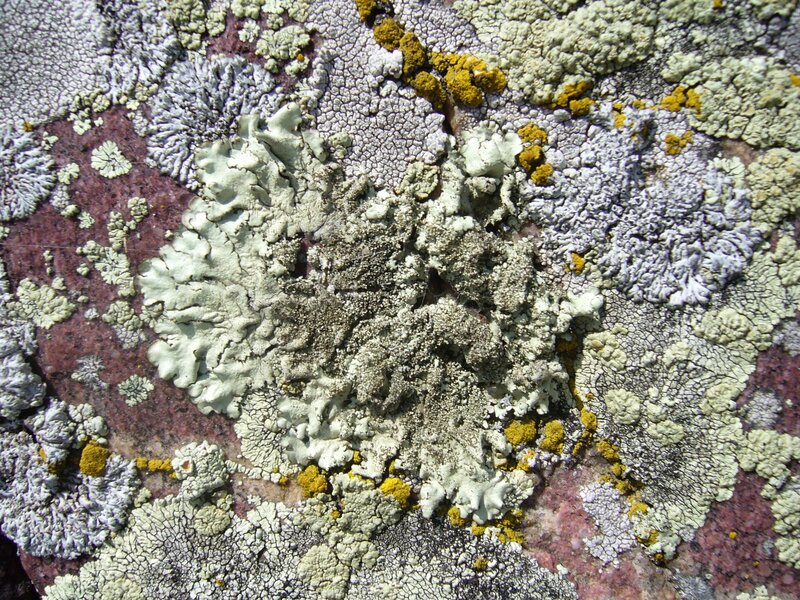 A century of weathering and recolonization by lichens and mosses have softened the scars on the rocks, leaving little to indicate that such a dramatic alteration took place. However, standing in front of the falls, finding that “zone” where the temperature suddenly drops and cool wet mist blows on the face, and thinking about the significance of this place to the Native American tribes who held it so sacred, I was left feeling bewildered at how such drastic measures could have been contemplated for so beautiful a place. In addition to the falls, nature has created some striking sculptures in the rock. 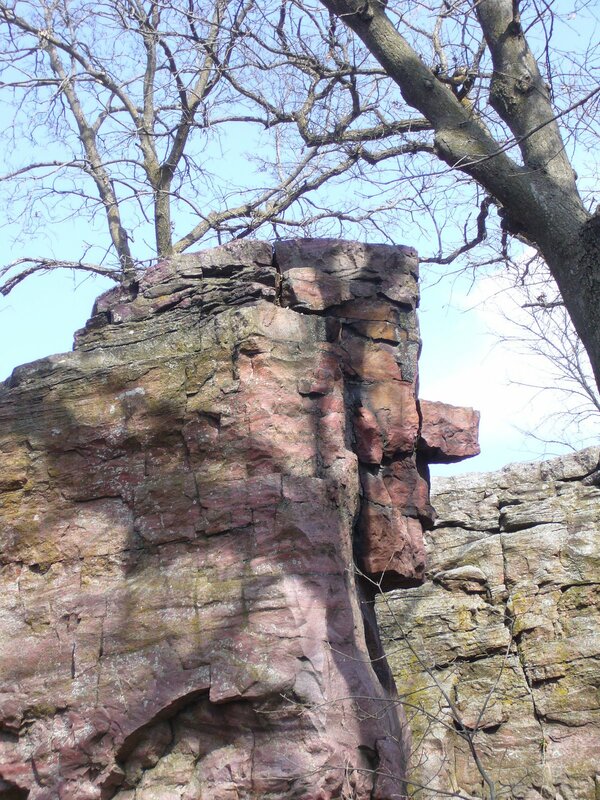 “Old Stone Face” can hardly be mistaken for anything else – despite its human likeness, it was created entirely by natural forces. “The Oracle” is another naturally-formed human likeness found (though not as easily as Old Stone Face) in the outlines of the rocks. Tribal Shamans (Medicine Men) believed it served as a guardian of the valley and that voices issued from it’s cold stone lips. I stared for awhile and strained to listen, trying to imagine what words it might have spoken. At first, it seemed as if all was silent. Then I noticed the sound of the wind rolling over the prairie and twirling through the gnarled oaks. I heard the falls in the distance. I heard birds in the midst of frantic early-spring songs. I thought perhaps these might be the voices that guided the Shamans – spoken so loudly, yet so easily unheard. 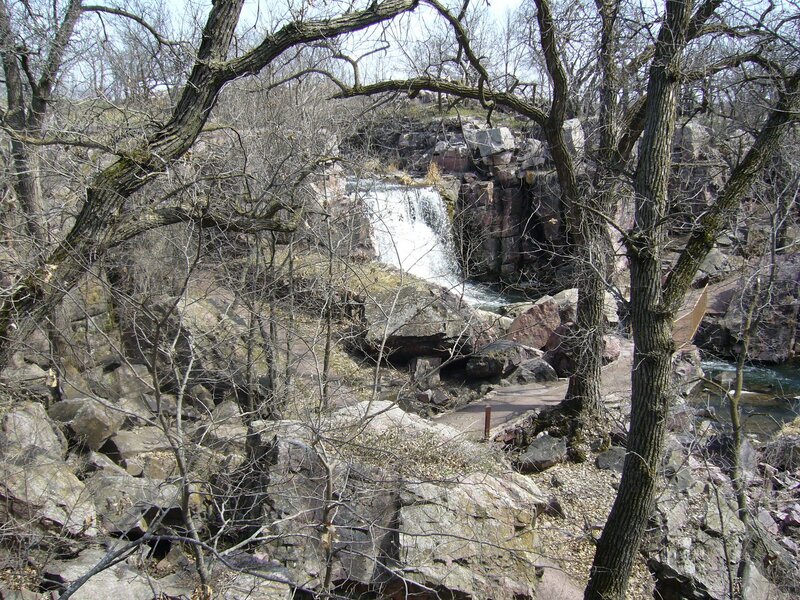 The first U.S. government expedition to the quarry occurred in 1838 with Joseph Nicollet, a French scientist who was sent to map the upper Mississippi country. 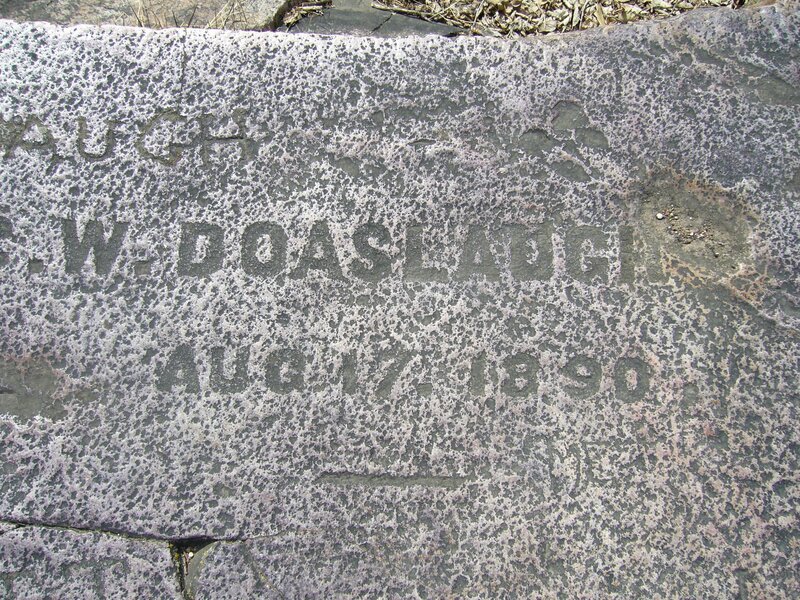 He and the members of his expedition carved their names in the rocks atop the escarpment, as did many of the early pioneers that first settled in the area. 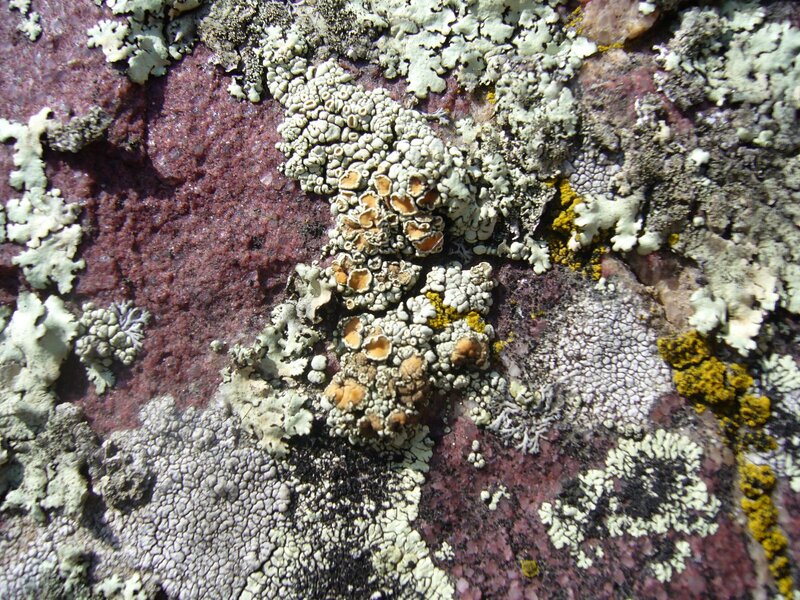 In studying the surface of these rocks, I couldn’t help but notice the incredible diversity of lichens to be found. Around 75 species are known from the area, and as shown in the photos I share below they come in a fantastic array of forms and colors. 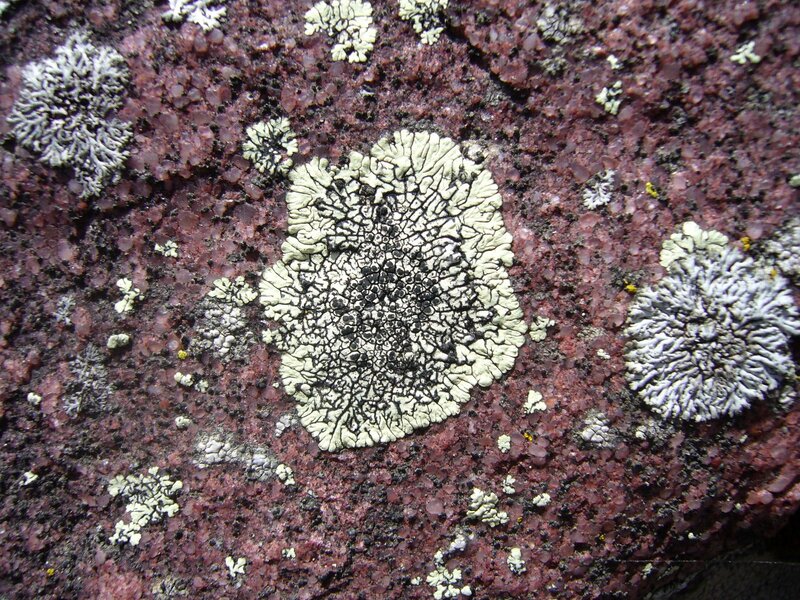 Lichens are primary colonizers of rock surfaces, able to do so as a result of their nutritional autonomy. 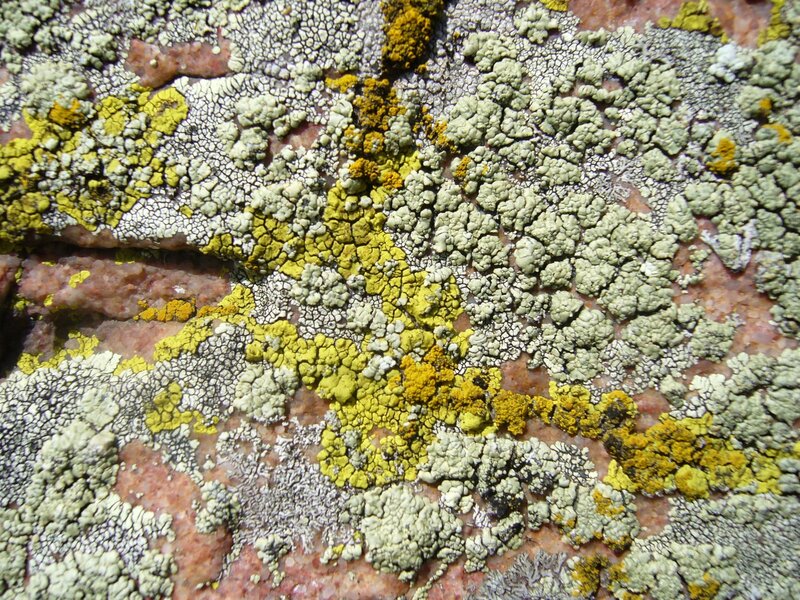 Lichens are merely fungi that have evolved a specialised mode of nutrition: symbiosis with photosynthetic microalgae or cyanobacteria. Often, the algal component is capable of fixing nitrogen from the atmosphere, while the fungal organism attacks the rock with organic acids to release minerals. This is the basis of soil formation. Over time, enough soil accumulates in small depressions to allow mosses to colonize the rock surface. As successive generations of moss grow and die, more and more organic material accumulates on the rock surface, eventually supporting the growth of vascular plants (which extract nitrogen from the soil, rather than from atmospheric sources). These cycles of growth and death act in concert with the forces of erosion to ultimately convert barren rock to tallgrass prairie, hardwood forest, or other climax habitat. 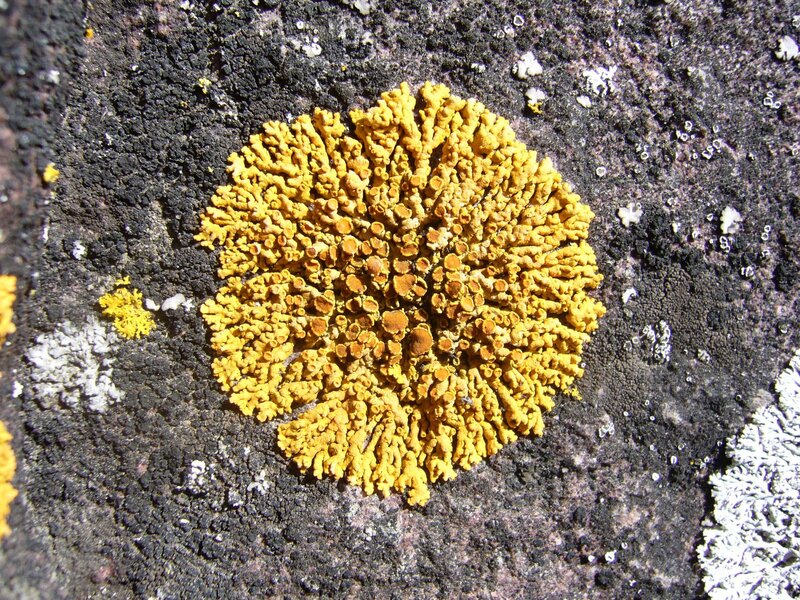 Mind you, this is an extraordinarily slow process – it can take a full century for a lichen to grow one inch! As I looked at the abundance and diversity of lichens on the rock surfaces, I tried to visualize the breadth of time encompassed by what was before me and quickly became lost in eternity. 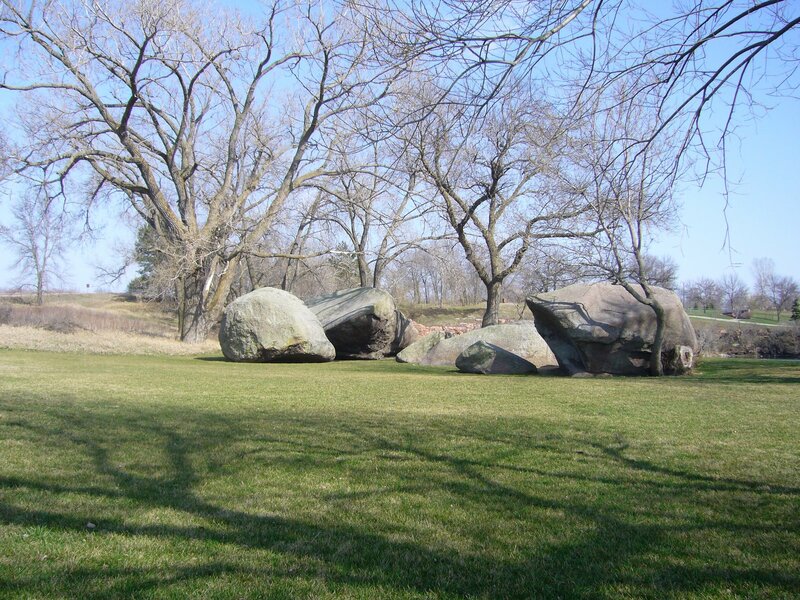 Native Americans believe that these boulders shelter the spirits of maidens who demand offerings before permitting them to quarry the pipestone. Science tells us that the boulders are composed of granite and were likely carried here by glaciers during the past 1 million to 10,000 years ago. Originally a single boulder some 50 feet in diameter, repeated freezing and thawing over the millenia since it was dropped here have split the boulder into the several pieces seen here. Perhaps only The Oracle knows which is true. For a more detailed, yet highly readable account of the geology of this area, please consult Minnesota Geology, Field Trip, Summer 2000 and Other MN DNR Workshops, by Arlyn DeBruyckere. 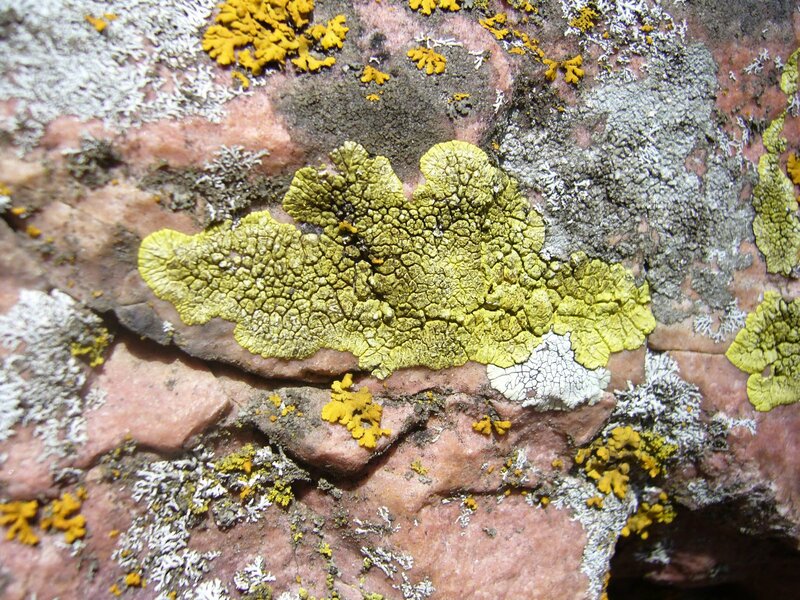 This entry was posted in Anacardiaceae, Fagaceae, Fungi, Oleaceae, Rosaceae, Ulmaceae and tagged Botany, conservation, cultural history, geology, habitat management, Hiking, indigenous cultures, landscapes, lichens, Minnesota, nature, prairies, science, trees. Bookmark the permalink. Thanks for the very informative post … sounds as if much natural and cultural history is contained within this one (relatively) small area. Allison – your praise humbles me. “Ozark Highlands of Missouri” has truly inspired me – I’ve been spending many a evening going through its archives, savoring the nuanced and textured writings. As a natural history blog, yours had what mine lacked – spirituality and moral conviction. I have since tried to (hopefully successfully) add these things to my own writings. Thank you!